On Thursday the pair AUD/USD has lost more than 50 points due to the negative data on Eurozone’s GDP of first quarter of 2014. Preliminary figures have reached only 0,2%, although the forecast had been much higher. Today the pair is still falling after a small correction. The key level is the lower border of two-week trading channel (0.9409-0.9320). If this level is broken down, the pair will continue to fall down to the levels of 0.9300 and 0.9270 (Fibonacci level of 23.6%). Technical indicators confirm the Bearish trend. MACD histogram has crossed the zero line from above, forming a signal to sell. Stochastic lines are going to cross and turn down. Support levels: 0.9320, 0.9300, 0.9270. Resistance levels: 0.9355, 0.9380, 0.9409. 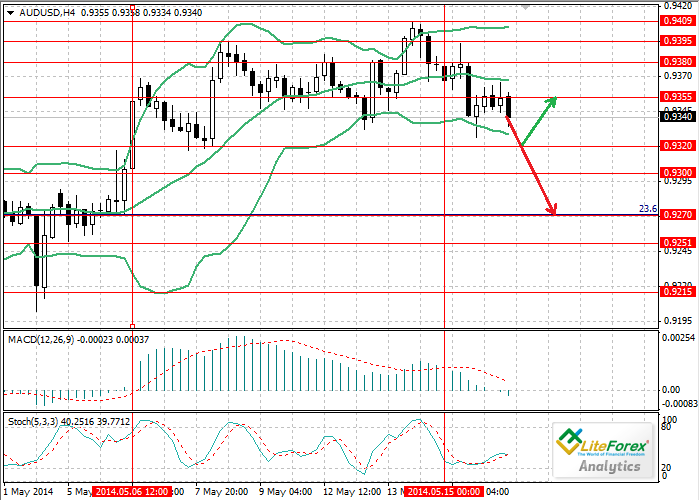 Short positions can be opened at 0.9320 with targets around 0.9270.